According to a 2012 Gallup Poll, the average American woman is heavier than she was 20 years ago-and her “ideal” weight is heavier, too. Researchers asked a random sample of 1,015 American adults about their current weight and related attitudes. Then they compared the results to data collected from a different sample in 1990. On average, women weigh 14 pounds more than the women polled 22 years ago and their average ideal weight is now 11 pounds heavier than it was back then. One weight-gain culprit could be sleep deprivation, which can seriously slow your metabolism. Which makes sense: 60 percent of the people polled said their weight is about right. That’s in spite of the fact that 60 percent of Americans are overweight or obese. Some people are content with being overweight but it’s also likely that many people don’t realize that their perceptions of normal-and healthy-are skewed. So how can you be sure that your ideal weight is as ideal as you think? Surprisingly, Body Mass Index (BMI) isn’t a good predictor-BMI measures ignore factors such as body type, genetics, and muscle mass. Your best bet is to think in terms of health and happiness, not numbers. Just think about the time that you felt your healthiest, when you were eating well without starving yourself. 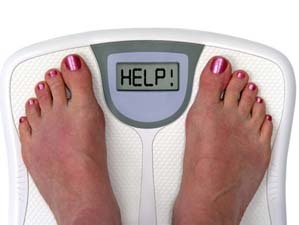 If you need a number to latch onto, make it your goal to return to what you weighed then. But be realistic: weighing what you did in high school or on your wedding day might not be attainable. If you can’t recall a time when you felt healthy, begin with the standard formula for calculating the ideal weight for women: Allow 100 pounds for your first 5 feet, then add 5 pounds for every extra inch. To account for muscle mass, body shape, size, and genetics, add and subtract 10 percent. This is your healthy weight range. So, if you’re 5-feet 3-inches tall, your healthy range is between 103.5 to 126.5 pounds. It’s still a very generic number, but the range makes it a little more accurate and a good guideline. If you want more accurate calculations in my book,‘get fit stay fit’ and ‘the best you can be’ there are many calculations to help you analyze your physical features to achieve accurate weight and weight loss goals.